ShutUp10 is a smart little program that can help ensure that your privacy data is not in the wrong hands. Windows 10 is the most popular operating system, and this is due, among other things, to that the alternatives are relatively poor. Linux and Mac are good competitors, but Windows 10 has a recognition factor that is difficult to outperform. Most people are familiar with Windows 10 and it is difficult to wean with the functionality of a control system. In addition, the majority of programs and games are designed for Windows 10 whereas Linux and Mac are limited. Most of us use Windows 10 without much thought about it, but it has been found that Windows 10 collects some data that you might not have expected. Windows 10 shares your private data with Microsoft and certain applications pre-installed on the system. 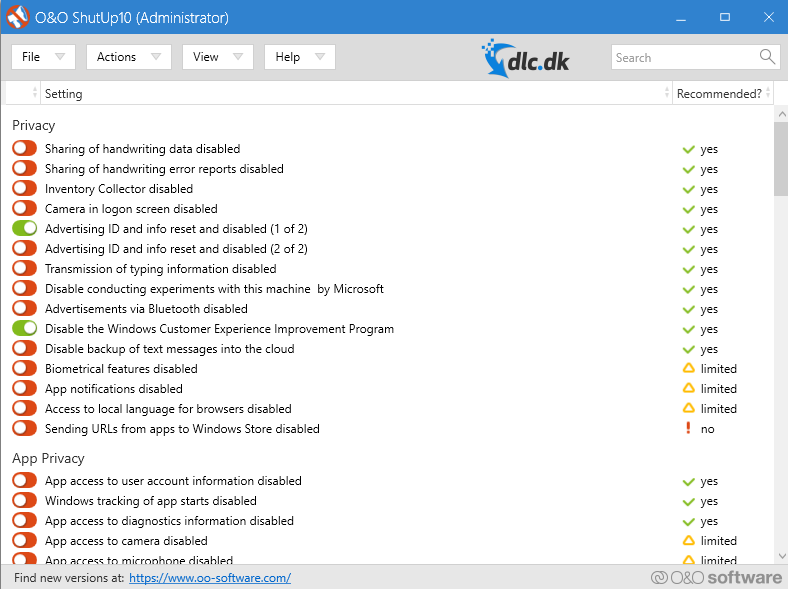 With ShutUp10 you have the opportunity to block everything Windows 10 wants to collect. The program has automatically found areas that Windows 10 uses to share various data, and you just have to navigate a little around the program and you do not have to locate the threats yourself. If you want to disable a given function, you just have to press the button, as can be seen above. 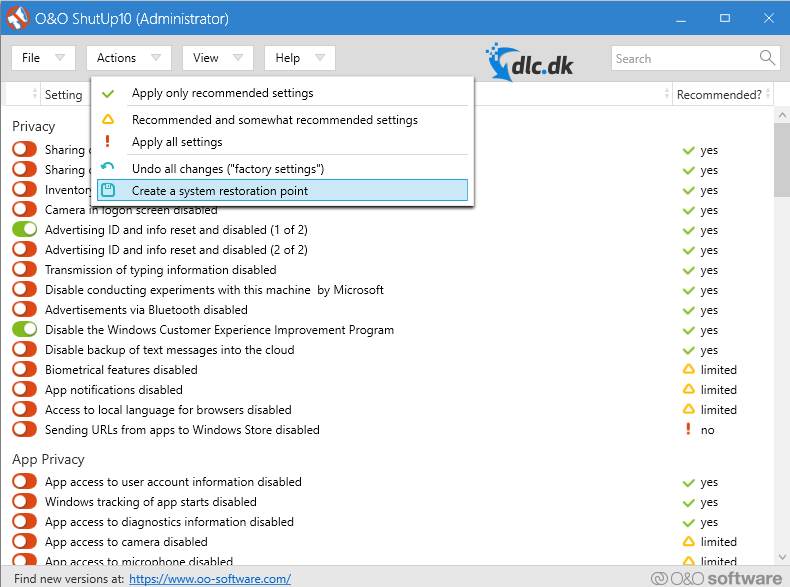 When turning a function on / off for the first time, ShutUp10 will recommend you create a system restore point. We can only recommend this, as there may be complications and disadvantages in one's control system. However, this is not something that we have experienced, but therefore it is still a good idea to stay ahead. As said, ShutUp10 has an incredibly simple design that most people can find out, no matter how much technological experience they have. The above images show that you have a recommended section on the right of the program. This section contains either yes, no or limited, which indicates whether it is recommended that the functions in question be switched on or off. This contributes to the fact that most people can find out whether these are functions that one should be aware of or not. In the actions tab, it is possible to select all the recommended functions at once. This means that you can quickly get optimal security for one's private data without having to put much effort into it. As the pictures and videos illustrate, ShutUp10 has an incredibly simple design. In fact, the program is so simple that you don't even have to install it. Once you have downloaded it, you just have to open the file. The simple design consists primarily of tabs that you have easy access to. Since the design is so simple, it also means that the vast majority can use the program. The functions are located right where you expect them. ShutUp10 is also very indicative as it would like to help one on the way so that you can make sure that you choose to turn the right functions on or off. 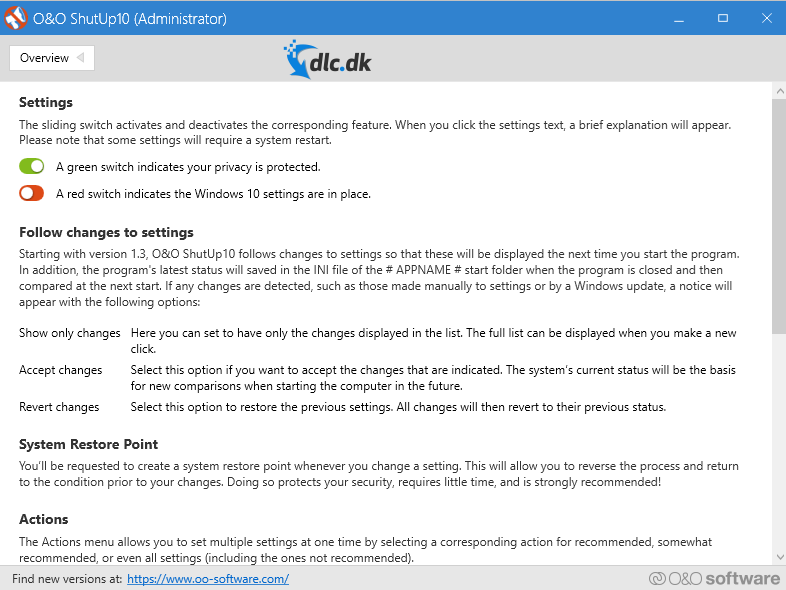 It can be dangerous to mess with Windows 10 data, but ShutUp10 has done it safely, as you are always asked if you do not want to create a new restore point. This means that even if you make a complete mess in the operating system, you still have the opportunity to go back and fix the error. Privacy programs are growing in the interest of consumers, and that is for good reason. Most users have become aware of how much data is left when using a computer. Privacy data scandals have, of course, also contributed to this, as one thereby begins to investigate what it really is that one leaves behind. Although Windows 10 is so popular a control voice, it shares data with Microsoft and applications, and if you are not aware of it, you can risk being exploited. With ShutUp10 you can stop these sharing as the program completely blocks all forms of sharing. ShutUp10 is easy to use, and although you do not have the great technological experience, you can stop Windows 10 to exploit and share one's data. 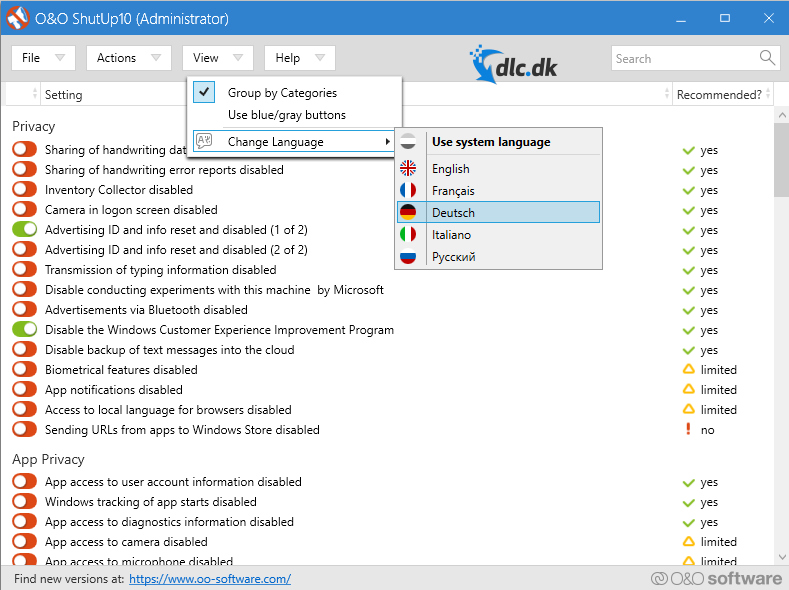 Find ShutUp10, mark it and choose "Uninstall"
Should ShutUp10 has been damaged or corrupted and thereby difficult to remove we can recommend you finding help to uninstall it here.